Michelle Obama caused a stir when she said, "for the first time in my adult lifetime I am really proud of my country." Well for the first time in my lifetime, I am embarrassed of my country. Ashamed even. Have we forgotten what democracy means? We elected 300-odd people to represent us, not one. The idea that if the Prime Minister doesn't have the confidence of Parliament he can take his ball and go home is completely insane. Right now, we need a government to lead us. The world is a mess. Every day, more people are thrown out of work. We lost four more from our department just today. This is not the time for Parliament to take an extended winter break, to wait a month and hope the crisis has magically resolved itself. This is a time for action, and instead we get avoidance. Our Governor General just faced an immense task, and made the worst decision possible. 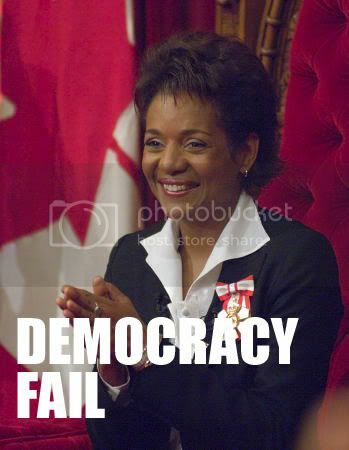 Shame on you Michaelle Jean for disappointing every Canadian who voted, and shame on you Stephen Harper for being afraid to do your job. For those who don't check in every day: you can now join the mailing list by clicking here to send me a blank email with SUBSCRIBE in the subject header. You'll receive rare and infrequent emails when something exciting happens.